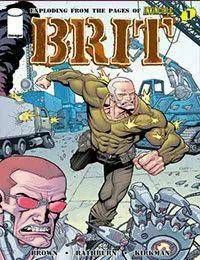 Meet Brit, the governments last line of defense when it comes to the really messy parts of keeping the world safe. When super-powered menaces threaten our home soil, send in this one-man killing machine: Hes indestructible, unstoppable, and eligible for a senior citizens discount. Brit and Jessica are having a good time raising their new son, Brittany Jr. With Brit back at his job with the government, theyre well off and living large. That is, until a race of vicious aliens decides the time is right to strike Earth, and their first target is the United States of America. Brits not likely to let something like that go down in his backyard.